ww2dbaseGraves Blanchard Erskine was born in Louisiana, United States. He joined the Louisiana National Guard and then the US Marine Corps Reserve while attending Louisiana State University between Sep 1912 and Jun 1917. In Jul 1917, he joined the US Marine Corps with the rank of second lieutenant. In Jan 1918, as a platoon leader in the 6th Marine Regiment, he set sail for France to participate in WW1; in that war, he saw action at Chateau-Thierry, Belleau Wood, Bouresches, Soissons, and St. Mihiel. Seriously wounded during the St. Mihiel offensive, he was evacuated to the United States in Oct 1918; he would undergo nine surgeries in the following year in treating his wounds. He was awarded the Silver Star medal for his WW1 service. In the 1920s, he served as a recruiter in Kansas City, Missouri, United States; with 1st Provisional Marine Brigade in Haiti; aboard USS Olympia; with 2nd Marine Brigade in Santo Domingo, Dominican Republic; as Depot Quartermaster at Quantico, Virginia, United States; studied at US Army Infantry School, Fort Benning, Georgia, United States; served as an instructor at Marine Corps Schools, Quantico, Virginia, United States; and with 2nd Marine Brigade and Nicaragua National Guard Detachment in Nicaragua. In the 1930s prior to WW2, he served as an instructor at the Basic School, Marine Barracks, Philadelphia Navy Yard, Pennsylvania, United States; studied at Command and General Staff School, Fort Leavenworth, Kansas, United States; served as an instructor at Marine Corps Schools, Quantico, Virginia, United States; and served with the Marine Detachment at the American Embassy in Beiping, China. He returned to the United States about a month prior to the outbreak of WW2 in China to serve as a section chief at Marine Corps Schools in Quantico starting in Jun 1937. He subsequently served as the executive officer of 5th Marine Regiment at Quantico and Guantanamo Bay, Cuba. ww2dbaseAfter the United States became involved in WW2, Erskine served as the Chief of Staff of the Amphibious Force (later Amphibious Corps) of the US Navy Atlantic Fleet. In Sep 1942, he was transferred to Amphibious Corps of the Pacific Fleet, serving as its Chief of Staff; in this position, he was based in San Diego, California, United States between Sep 1942 and Jul 1943, and then in the US Territory of Alaska between Jul and Aug 1943 during the landings on Attu and Kiska of the Aleutian Islands. In Aug 1943, he was made the Chief of Staff of the V Amphibious Corps. In Nov 1943, he was promoted to the rank of brigadier general and was made the deputy commanding officer of V Amphibious Corps. He participated in the planning and execution of the various landings in the Marshall Islands and the Mariana Islands. In Sep 1944, he was promoted to the rank of major general. In Oct 1944, he was made the commanding officer of 3rd Marine Division, in which role he oversaw the invasion of Iwo Jima, for which he would be awarded the Navy Distinguished Service Medal. ww2dbaseAfter WW2, Erskine remained the commanding officer of 3rd Marine Division, based in the US Territory of Guam, through Oct 1945. In Oct 1945, he was made the head of the Retraining and Reemployment Administration in Washington DC, United States. He returned to military service in Jun 1947 as the commander of Marine Barracks, Marine Training and Replacement Command based in Camp Pendleton, California, United States. In Jul 1947, he was made simultaneously the commanding officer of 1st Marine Division and commanding officer of Camp Pendleton. In May 1949, he took on the concurrent role as the deputy commanding officer of Fleet Marine Force, Pacific. 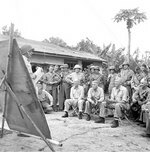 In Jun 1950, he was made the Chief of Military Group, Joint State-Defense Mutual Defense Assistance Program Survey Mission to Southeast Asia; in this role, he visited the Philippines, French Indochina, British Malaya, Thailand, and Indonesia. In Dec 1950, he became the head of the Department of the Pacific based in San Francisco, California, United States. In Jul 1951, he was made the commanding officer of Fleet Marine Force, Atlantic. He retired from the US Marine Corps in Jun 1953; he was given the rank of a full general in the following month. Between 1953 and 1961, he served Director of Special Operations of the United States Department of Defense. He retired in 1961 and passed away in May 1973. He was buried at Arlington National Cemetery in Virginia, United States. 28 Jun 1897 Graves Erskine was born in Columbia, Louisiana, United States. 21 May 1917 Graves Erskine joined the United States Marine Corps Reserve while attending Louisiana State University in Louisiana, United States. 5 Jul 1917 Graves Erskine joined the United States Marine Corps at the rank of second lieutenant. 1 Jul 1953 Graves Erskine was promoted to the rank of general. 31 Oct 1961 Graves Erskine stepped down as the Director of Special Operations of the United States Department of Defense. 21 May 1973 Graves Erskine passed away in Bethesda, Maryland, United States.